The 28th of last month was a banner day for Pearl Jam: They played to an ecstatic crowd at the Outside Lands festival at Golden Gate Park in San Francisco, slaying the crowd with two hours’ worth of classics and new songs. Earlier that day, lead guitarist Mike McCready found time to sit down with Zine writer/editor Brett Milano for this exclusive backstage interview. It begins with McCready remembering the last time Pearl Jam played Golden Gate Park in 1995…a notorious night when Eddie Vedder was laid out by food poisoning, and Neil Young stepped in to finish the set. From there we visit some key moments in Pearl Jam history and get some insight on many tracks from the new album. He even reveals the inspiration for the new album’s upbeat tone—yes, it’s political content!—and gives Rock Band guitarists a hint on which solo to attack first. Don’t forget, the new album Backspacer is available this week as full-album DLC. If you were at Outside Lands and want to relive it, go here for Brett’s report from the day. Brett Milano: So Pearl Jam and Rock Band have been a really good match thus far. We did Ten and we’re about to do Backspacer. I believe Matt is the main gamer in the band, but I was wondering if you all had a chance to [play it]? 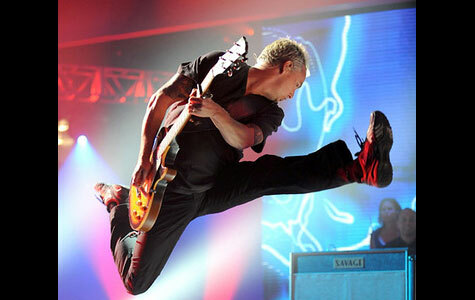 Mike McCready: I have done it. I play it, I play Rock Band with my friends’ kids who are over sometimes if we’re having a party. And they’ll completely beat me senseless with it and I feel like I’m kind of holding them down. Like, I’ll try to play the drums, and I just can’t play the drums. It’s kinda hard. So I have played it a few times and I think I need to work on my skills, because I can’t get it as well as the kids. BM: Have you at least investigated your own solos to see how they translate? BM: So Backspacer’s a great record from what I’ve come to know of it thus far. BM: When you were working on the re-issue of Ten, you were working on the new album at the same time? BM: So I was wondering if going back and re-investigating your old stuff had any effect on how you proceeded with the new stuff. MM: I think the fact that we had wanted to take Ten and re-mix it, make it sound a little drier and Jeff Ament, our bass player, had wanted that to happen [for] a long time and it finally did. Both of those things kind of coincided at the same time. It probably had some sort of influence on how this new record came out, but I think songwriting-wise I don’t believe it did because I think we’re all kind of different people now. We’re older. We have a new drummer, Matt. I mean, he’s been our drummer for the longest time, but he kinda wrote the new single and I think our new songs are just a different bunch of songs than we were writing back when we were in our twenties and stuff. Sonically and soundwise it may sound crisper, they may sound equally as crisp. But other than that I think there’s not a lot in common. BM: I think one reaction a lot of us are having is that mostly it’s very up and very celebratory. I’m wondering what prompted that. MM: From my own point of view, I would imagine we’ve gotten out out [from] under eight years of horrible government and we now have a new president and we’re all elated and excited about the fact that there’s actually some hope and somebody smart in the White House and things are affecting our lives in a way that’s positive whereas it hadn’t been for many, many years. That makes us all as U.S. citizens and in our band excited about being around right now. I think that has a lot to do with it. BM: I was wondering if “The Fixer” was a song specifically about that, because it seems like it ties in. MM: I think “The Fixer” is a song, from my understanding, is more of a song of Eddie (Vedder, singer) writing about himself, about he kind of gets together and he’ll listen to everybody else’s ideas. And he’ll bring in some and won’t bring in other things. And he’s kind of like this scientist behind the scenes, mad scientist I guess, I don’t know. And he puts it together and he fixes it in a way. I’m guessing that’s what it’s about. But you can infer it to our latest political climate too. So hopefully. BM: I noticed you kept the songs very short, very direct, kind of garage-y. Were you sort of reining in the tendencies to make them a little bit more like that? MM: I think we didn’t initially know that we were reining them in. We had about seventeen ideas going into this project, seventeen to twenty. And when we were at about eleven pretty much finished, Brendan (O’Brien, producer) and Ed sat down and said, “Hey, this looks like a really good record.” Stone (Gossard, guitarist) had been talking about wanting to have a record that was shorter, more concise and I think we achieved that. That being said, we still have other songs that are out there that are from this session that we may do something with in about six months. But that seemed like the perfect amount of songs. And it hearkens back to our favorite records growing up. Aerosmith Rocks was like nine songs, and old Van Halen records for me were like eight or nine songs. I’m dating myself right now, but that’s the stuff. Those are really good records to me, and you don’t have to have a lot of stuff on them. BM: Yeah. Johnny Guitar got referenced in one song. I was wondering how he made his way into a Pearl Jam song. MM: There was actually a picture of one of his records up in our warehouse when we bought our warehouse. And there was this one wall, specifically in the bathroom, that had a bunch of vinyl records and one of his records was on the wall and he was on a tricycle. And I think it was when the gas crisis was going on or something in the early ’70s when he put that record out. He’s on his tricycle and surrounded by these women and we just thought it was kind of…I think Ed found it and ironic cover. And, as his brain will do, he came up with ideas from there. You’re the first person that’s asked about that song for many interviews that I’ve been doing, so I’m glad that came out. Matt wrote the music to it, too. BM: It’s a good one. I also wanted to ask about “The End,” which to me is a real left turn at the end of the album because you’ve been on this more upbeat, very alive groove and then suddenly we have a song basically about dying. MM: Yeah. Or it’s about living. It could be about holding on to the moments that you cherish dearly with your loved ones and your family and remembering that we’re only here temporarily. But that’s a song that Ed had on a demo version and it almost sounds exactly like the demo. And he played it for us and it was just kind of haunting and it was perfect. So he re-recorded it and it almost sounds exactly like the demo. It sounds as haunting and poignant and to the point as the original and a great way to end the record, I guess. BM: Do you know what kind of day he was having when he wrote that? MM: I don’t know…you’d have to ask him. I don’t know what his process was behind that. I just knew it was a great song. BM: Does he tend to come in with the whole thing formed in terms of lyrical ideas? And I assume you have some kind of intuitive sense of where he’s coming from most times and what would work around it. MM: It’s a mixed bag. He will come in with a full song like “The End” all ready to go and then just lay it down himself. Or Stone will have a riff – we have this song called “Amongst the Waves” – and we’ll do that musically and get that all together tight, and then he’ll kind of come in and start humming harmonies and ideas over it. Go back on his typewriter and type stuff up, some lyrics. He’ll work on it overnight and then maybe come back in and cut it the next day or a week later or something. It’s kind of a different process for each song that I’ve noticed that he does. BM: So the whole idea of a Backspacer is you get to go back for something you did wrong and get to do it right. Was that idea behind any of this? MM: I like that you read that into it. [laughs] I think there could be that intent in there. I think that he got the initial idea from, on these 1930s typewriters that he collects and writes these lyrics on, there’s a key on it that says, “Backspacer.” Now it says “Backspace,” I believe. Anyways, that’s where he got that. I think it’s also what you were saying, and I think it’s also looking over your life from when you were a kid all the way up until now and there will be some artwork that will show you what I’m talking about when the record is released. The kind of young thought processes of us turn into art forms on the record, by this guy named Tom Tomorrow, who’s a great artist. BM: Oh yes, This Modern World. MM: So you know him. He did all the artwork on it. BM: Aside from the political thing you mentioned, was there a sense of, “Here we are, we’re this number of years on, we’re in a good place” – was that the prompting on this record? MM: I think that’s just kind of stated in our everyday lives. We feel like we’re all super grateful to still be around playing music and people come out and see us, and that we all get along still. We talk and we still have fights and things like that, but we feel like we like making music with each other still. And people enjoy it, I guess. So there’s that feeling of more of a calmness that we were here back in the windstorm when we were really huge, back in ‘95, ‘96 when we didn’t know what to do other than just ride it out. And then sometimes crash and sometimes not. I think we’re more composed now, but I think we still play great. Hopefully we play better than we did back then. Because we have more songs now. We have like 200 songs, it’s crazy. BM: I assume that was a long process that the fans kind of shared with the band in terms of the success of the band and how you reacted to it. And here you are still successful, but I assume you have a way of going about it now that you’ve learned over the years. MM: I think our fans had to be patient with us, and I think we lost fans over the years, certainly by doing things so much do-it-ourselves, not doing videos, to taking on certain causes that made us play a certain venues that were hard to get to. It made it hard for people to come to see us. And I applaud people that have stuck with us through there, because I don’t know if I would have. Restate your question again, because I think I lost it. BM: Just talking about the comfort with success and the level you’re at, and I assume you must have developed some method of working with it so it feels good. MM: I think yeah. We’ll take care of that in editing. [laughs] I think some of that comes with age. We’re all older, in our 40s now, and we have families. Those are the priorities. That stuff is the priority now. Music is fun and it’s great and it’s our job and we’re successful at it, and I’m very grateful about that, but there are other things in life. Whereas before, it’s all about going headlong into it and maybe crashing a few times on our way to here. We are, like I said, grateful to still be around. BM: One thing we like to do in Rock Band is to show that even the greatest bands have their little formative gigs in tiny places. I wanted to ask Pearl Jam about a place like the Off Ramp, which is kind of legendary as being like the Cavern Club. If you could sort of bring me back to that first gig and what the atmosphere was like. BM: [laughs] I remember the first gig at the Off Ramp as being kind of hectic because I was nervous that we were playing a show too early. Jeff and Stone were in a contract with Polygram Records and they hadn’t gotten out of it yet, and here we are showing off our new band eight or ten days after we had gotten together. And Stone was like, “Eh, let’s go play a show and see how it goes.” And I was worried business-wise that this was not a smart idea. But that being said, I also wanted to play because I felt like we had a really good band. Ed had just come up and we were just, it was the first time I was in a band situation when everything was really firing on all cylinders. There was not a weak link in the band. The Off Ramp’s a tiny, tiny club. It’s still there. It’s been under three different names over the years. I think it’s called El Corazon now and there’s a pole, basically in the middle of the stage that you always have to go around. I don’t know if you’ve seen it or been there, but it’s very small and kind of scary. We were there and there was a big buzz because it was kind of the next level of what Jeff and Stone were doing. Mother Love Bone was pretty notorious around town and famous, so people were there kind of checking this out and going, “What is this all about?” And I think we won over those early crowds just by doing our songs and playing with as much conviction and excitement as five young guys could. It was exciting and exhilarating. It was kind of oversold. It went by very fast, that’s all I can say. And then we were off to start doing the record, and then we were on a van tour with Alice in Chains, and after that we were on another van tour, and after that we were opening up for the Peppers, and after that we were in Lollapalooza, and then [explosion noise] everything blew up. BM: And then that happened. MM: [laughs] Yeah. And that whole thing. Nirvana hit number one. And everything went crazy. BM: We do have Drop In the Park, a couple of tracks from that in the game. BM: Which makes me think about the whole legend of Eddie and his little aerial adventure. BM: Climbing up. I was just wondering what you were thinking when you looked over and saw him doing that. MM: Of the many times that I’ve seen Ed do that over the years, my thought process is like, “Okay, he’s going to fall. And this is all over. He’s going to die. Please come down, and stop doing that.” But then also being exhilarated and excited about it too, because he’d do it in the middle of “Porch” I think. The one he did specifically at Drop in the Park, he hadn’t really done anything like that before. He kinda threw the microphone up over the lighting truss and climbed up it and then hung around up there and then came down or something, I’m forgetting. It was another one of those moments like, “Well, is he gonna fall?” But he’s super-strong, so I’ve never seen him fall. I’ve seen him go across the top of a fifty foot girder in the air in San Diego when we opened for the Peppers and Nirvana, for probably five minutes upside-down. And I’m going, “Let this guy come down, please come down. Is he gonna come down?” And certainly the Drop in the Park was an exciting show because we had a huge fight with the city to try to make this thing happen, and they shut us down the first time. For the first show that we wanted to do, they said we didn’t have the proper police protection or blah blah blah, or whatever. But we felt we did hire all these people. They shut it down at Gasworks Park the day of the show, and so it pissed off all the parents that had dropped off all their kids. So they called into the mayor. When we put on shows, we want to make them as easy and as safe as possible. And we were very conscious of that for the first Drop in the Park and for the second. Because we had to work with the city to make that show happen and it was hard. It was 50,000 people at a free show. It was much like that show that was here. And this one happened. It was a cool…I’ll never forget it. It was a wonderful experience. It was this old place where I used to play as a kid. BM: So now you’re one of those bands where a lot of your fans will collect all the live shows and compare notes about everything that’s played at every show and different versions of the songs. Does that affect what you do on stage? That you give them something to notice every time? MM: I think that Ed is conscious of that. I think as we do come into towns and we play shows, we’ll look at the setlists that we’ve played over the last ten years in that town and actually go over and – Ed will do this – and go, “Okay, we played this here in the early ’90s or something, so we won’t play that.” And he has this incredible memory and we want to make sure that we’re giving the fans something new every night, and to keep it exciting for us, too. Like I said earlier, we do have about 200 songs that we can pull from and there’s stuff I forget about all the time. “Oh yeah, there’s that song. We should do that.” And we’ll try it at soundcheck and sometimes it works and sometimes it doesn’t. You want to keep it interesting for yourself and then for the fans. Because that makes people want to collect stuff and to come back and check us out because they’ll get a different, almost completely different setlist every night. BM: Since people are playing the entire album on Rock Band, are there any either songs or moments in songs that you think are really exciting that you want them to pay attention to? MM: Yeah, I would say try the solo on “Amongst the Waves.” I felt good about that. And just kind of rock out to “Gonna See My Friend.” That’ll be fun to jump around to and play. And in terms of harder songs to play, I’m not sure…play ‘em all. BM: Do you recommend they jump around and stomp? MM: That’s rock. Right? That’s rock & roll.